KIEV, Ukraine -- Ukrainian Prime Minister Mykola Azarov said that the European Union has every reason to relax visa requirements for Ukrainian citizens, the Kyiv Post reported Friday, citing Interfax news agency. European Enlargement and Neighbourhood Policy Commissioner Stefan Fuele takes notes. 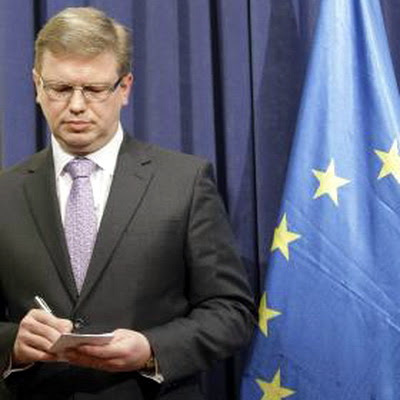 He said this during a meeting with EU Commissioner for Enlargement and European Neighborhood Policy Stefan Fuele, the government's press service reported. The Ukrainian prime minister said that talks on the abolition of the visa regime started in 2004. Ukraine has met most of the demands set by the European Union, Azarov said. "We are abiding by a readmission agreement. We have no problems with the delimitation of borders and organization of border controls. We are ready to provide our citizens with passports with biometric data within six months," Azarov said. The prime minister noted that Ukraine expects more active steps from the European Union. "For Ukrainian citizens who support the idea of joining the European Union and know that visas for EU citizens were canceled five years ago, it is unclear why no progress has been made and why humiliating procedures when obtaining visas remain. So we are waiting for more active steps from the European Commission," Azarov said.